Dust mite allergies are caused by the little bugs that are normally known for living on our bed. 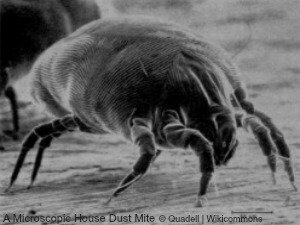 But what are dust mites? Dust mites are very small eight legged insects. There is no definite evidence that they affect eczema. But there are definitely some sufferers who would say they do. They are related to spiders. They are not visible to the naked eye. You need a magnifying glass to see them. Though they are quite ugly so you may not want to! They are so small that a family of them could sit on a pencil tip! Dust mite allergies are well known for affecting asthma and hay fever sufferers. There are also some reports that say they affect eczema. 3 in 10 people have dust mite allergies. It is not the actual mite that causes the reaction. Its their droppings. The enzymes that the droppings contain cause the allergy and the symptoms associated with it. The mites eat animal fur, pollen, mould and dead mites and more importantly to us, dead human skin. They live in warm, moist places. We spend around a third of our life in bed. Our bed provide a warm and humid environment. We provide food, our skin. Mites love both. No wonder our beds are a popular place for mites.They live in mattresses and you can find dust mites in pillows, duvets and sheets. There are preventative measures that can be taken to limit dust mite allergies. One way is to not make your bed in the morning. Airing it stops it getting warm, and dries it out. There are certain things you can do with items of bedding, which follow. These measures wont get rid of all of them, but can lessen the amount and the effect they have. A dust mite mattress cover can be used. This stops any contact with the insects and limits dust mite allergies. It also stops our dead skin getting onto the mattress. So cutting off their food supply. You can get a cover that just covers the top or one that covers the whole mattress. There are differing opinions on which is best. The top cover is not complete protection. While the whole cover doesn't allow the mattress to release moisture, that can cause it to rot. A cover must be comfortable to sleep on. You don’t want one that feels like you are sleeping on a plastic sheet. Find one that washes at a high temperature, at least 60c. High temperature washes help with killing dust mites, and getting rid of their droppings. Mattresses and other fabric covered furniture can be treated with a special spray that kills dust mites. It is sprayed onto the fabric. You can buy one with natural ingredients. There are some that contain chemicals, similar to ones used in insecticides. These chemicals could cause a skin reaction, so a natural one is recommended. It is advised to have duvets and pillows made of man-made fibre. Though avoid feathers if they cause irritation. Also if they are filled with silk or cashmere they are not able to withstand the high washing temperatures needed to kill the mites. They can be dry cleaned but some of the chemicals used could again irritate the skin. One way to reduce dust mite allergies is to put pillows and duvets in the freezer. The very cold temperatures kill the mites. The duvet and pillow covers you use are also important. You can get protective covers for these too. They are normally 100% cotton, so are chemical free. The covers need to be able to be washed at high temperatures too. Though most that are made for this purpose can be. A long pile carpet is more likely to attract house mites than a short pile one. Vacuuming everyday is a great way to reduce the chance of dust mite allergies. Everyday vacuuming is not always practical. So doing it at least 3 times a week is still very helpful. You can buy vacuum cleaners with a filter that may lower the number of the mites. Though there is nothing to suggest that they work any better than a normal cleaner. Or if they reduce the chance of you having dust mite allergies. When vacuuming it is important to do all areas. This includes right under your bed. 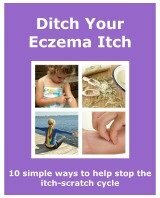 Though try not to do it when any children who have eczema are around. Also this is true when changing the bag. Dust seems to go everywhere. Never sweep the carpet, this sends dirt everywhere too. Before vacuuming, it is usual to dust. Don’t use a feather or cloth duster. They spread the dust around. It just ends up elsewhere round the room. The best way to dust is to damp-dust. Wet a cloth and wring it out so it is damp. Use it as you would a normal duster. The dampness of the cloth keeps the dirt on the cloth and out of the air. As I said earlier a short pile carpet is best. If your eczema is severe it may be worth looking into replacing your carpet with lino or wooden flooring. Mites cant live in these and they are easily cleaned. Because the cost of replacing carpets would be very expensive, it is only worth doing if it would make a big difference to the condition of your skin. Fabric covered armchairs and settees are more likely to collect dust. So mites will make them their home. Leather furniture is a better option. Though expensive. You could look into buying a second hand one. Though cost is not the only factor. They are just not some people's taste. If you have fabric covered furniture they can be vacuumed regularly. Or you could get some removable, washable covers. Or if you are clever, you could make some. Your furniture should be of a simple design so they are easy to clean, vacuum or damp dust. Soft furnishings include curtains and cushions. Instead of curtains, blinds would be a better option. Roller blinds rather than venetian. Venetian blinds collect dust and are difficult to clean. If you do have curtains, wash them at least 60c. If you must have cushions, well they do look nice, then have some that can be washed regularly. And again at a high temperature. Or put them in your freezer for a day or so. It is a good idea to keep your soft furnishings to a minimum. Though if dust mites are one of your triggers for your eczema, it is a good idea to leave them in the shop! Soft toys are another good breeding ground. They gather a lot of dust. They could be an issue for your child if they are affected by dust mite allergies. Again, either wash at a high temperature or put them in the freezer. An ideal solution is to not have soft toys in your child's bedroom. Though if one is your child's favourite toy you will know it probably isn't an option to remove it. So instead try and limit them to one or two. And wash them regularly. It can be time consuming to do all you can to lessen the amount of house dust mites. Doing just one thing, like using a protective mattress cover does not make much, if any difference. Everything needs to be done, and on a regular basis. House dust mites will be destroyed at the time, but will soon reappear. It is a constant battle. But with perseverance you will limit them to an amount that will not have too much affect on your eczema. You may decide that they don’t make too much difference, even no difference to your skin. So the time, effort and cost could be better spent on other ways to prevent and manage your eczema.